Desktop or DIY 3D printers are devices you can either buy preassembled as a kit, or build from a collection of parts to design and print physical objects including replacement household parts, custom toys, and even art, science, or engineering projects. Maybe you have one, or maybe you’re thinking about buying or building one.Practical 3D Printers takes you beyond how to build a 3D printer, to calibrating, customizing, and creating amazing models, including 3D printed text, a warship model, a robot platform, windup toys, and arcade-inspired alien invaders. 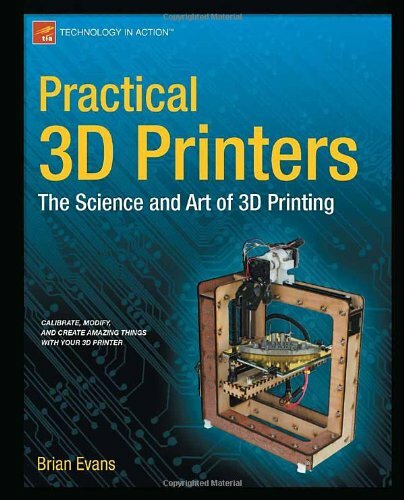 You’ll learn about the different types of personal 3D printers and how they work; from the MakerBot to the RepRap printers like the Huxley and Mendel, as well as the whiteAnt CNC featured in the Apress book Printing in Plastic.